Good morning polished world! How are you all today? Yet again, it is freezing here. Below zero nights with wind chills to match, it hasn't been pleasant. Personally, I'm enjoying my time inside baking, painting my nails, and lounging watching Netflix in my pajamas. 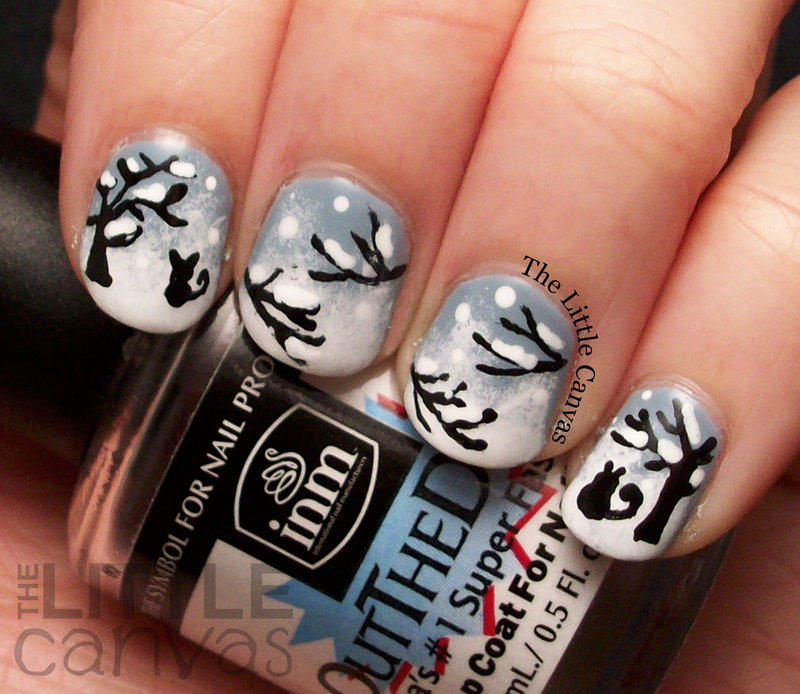 Since it is freezing, I decided to paint my nails with another winter scene. This manicure was completely inspired by this gorgeous creation by Pshiiit Polish. I stumbled across the design before Christmas on Pinterest and fell in love. I didn't think I was going to ever attempt it, but I'm so happy I finally decided to. It looks complicated and like it took a lot of time, but I swear, this manicure was so simple. I started off with a base coat of Orly Boho Bonnet. Even though this polish was released as part of last years Spring collection, I think it's a perfect winter polish. You know how the sky gets that dusty gray blue look this time of year, well to me, this polish resembles it most closely. 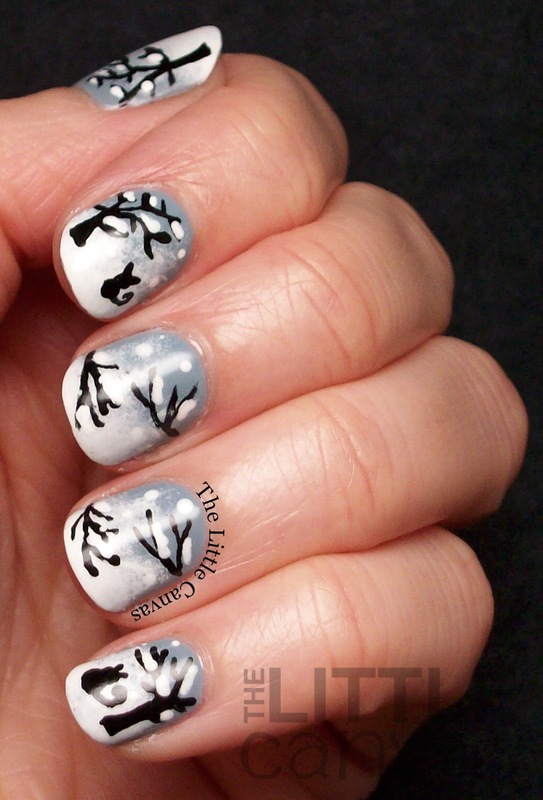 When my base was dried, I sponged Sinful Colors - Snow Me White onto the tips of my nails to look like a blustery, winter scene. 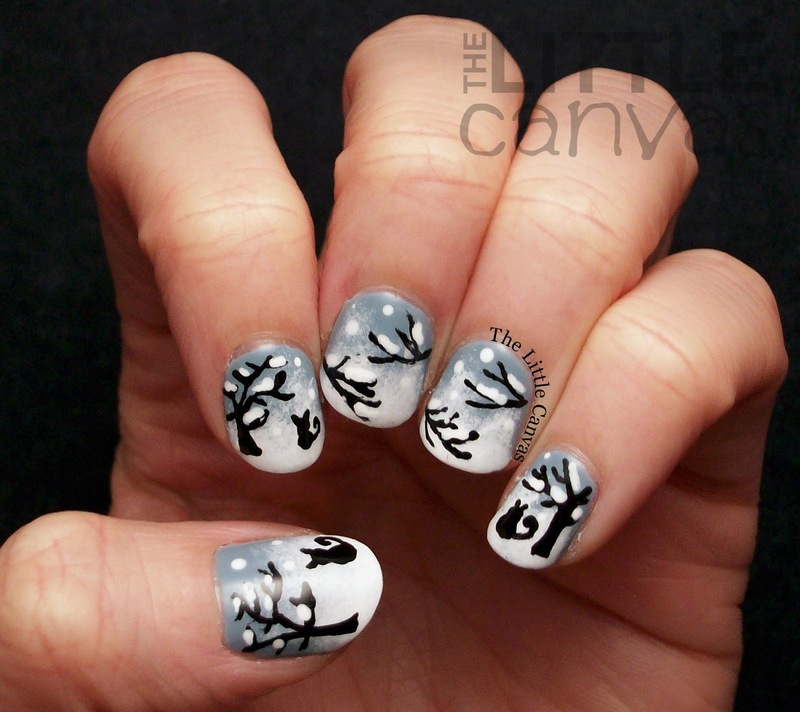 To me, it really looked like the wind was making snow drifts across my nails. After the white was dried, I dripped out some of the Instant Artist polish on a plate and used my nail art brush to create the trees and little kitty cats that Pshiiit had. 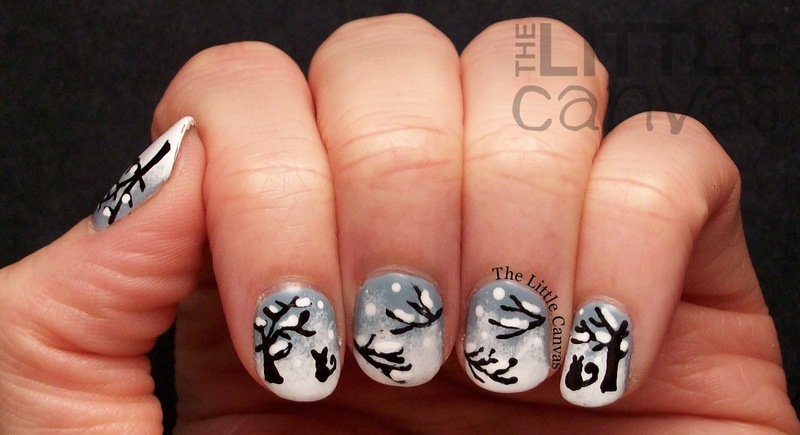 When the black dried (which was super fast), I went through and added the white snow dots on the branches, and random snow flakes with my dotting tool. So my kitties kind of looked like little fat squirrels. If you click the link above, you can see that Pshiiit's clearly look like little cats. Doesn't really matter to me though, squirrels are around in the winter time, so it totally worked. What do you think? Do you think I should have added INM Northern Lights? Part of me wishes I did, but the other part of me is glad I didn't because I think it would have taken away from the design. I hope everyone is staying warm!!! Until next time, <3. 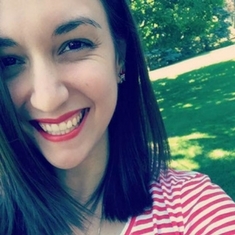 Twinsie Tuesday: Special Anniversary Post! Nail Art Society: California Dreaming! Zoya Awaken and Monet Press Release!